We're getting the band back together ... or at least we're bringing back our original drummer. Cory McKnight, former host of All WNY Radio's "Sabres Wrap Up" is returning to the airwaves with a short series called "Cory Comments On ..." giving the freelance writer and speaker a platform to discuss everything from his original All WNY Radio topic (the Sabres) to politics, heatlth, day-to-day life, and music. The first bit to air this afternoon is a rant on the band Tool. "Cory Comments On ..." will air following the 2 p.m. and 5 p.m. news each Monday, Wednesday and Friday. It will also be offered as a podcast, along with the rest of All WNY Radio's original programming. McKnight, a 28-year-old Rochester "lifer" is a writer, podcaster, musician, artist, skateboarder and motivator. His passions include local sports, music, and other entertainment. He is also a supporter and social media advocate for several local and state-wide not for profit organizations. He originally came to All WNY Radio in 2007. Just 18 at the time, he produced and recorded "Sabres Wrap Up," a weekly show discussing the Buffalo Sabres -- at a time it was much more fun to discuss the Buffalo Sabres. McKnight said the bit "is my view point -- raw and unfiltered, but also articulate and educational --with a soft spot for Western New York at the core." In addition to his new contributions to radio, McKnight has been given a green light to write opinion pieces on topics of his choosing. 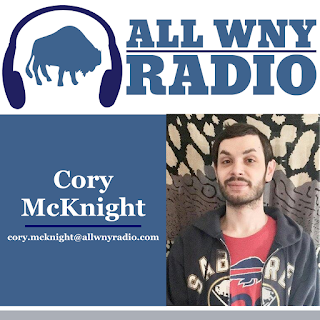 +Scott Leffler is the founder of All WNY Radio and proud to have Cory McKnight return to the fold.